If you've never shot a crossbow, you can't believe how powerful it really is. The crossbow gives its user far more power and accuracy than a traditional bow. Our pistol crossbow has a 50 pound draw, cocking lever, adjustable sights, safety, durable fiber construction, and comes with five plastic bolts (arrows). Bolts fired travel at 200 feet per second with pinpoint accuracy up to 60 yards. 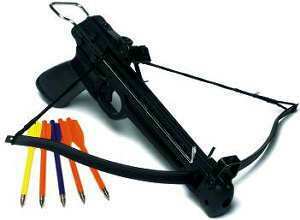 This pistol crossbow has outstanding performance and is powerful and portable. 150 lbs. of pressure draw. Comes with adjustable sights, safety, stand, durable fiber construction and 2 metal tipped, aluminum, 12 inch arrows. Fires at 250 feet per second with accuracy up to 65 yards. Pack of six aluminum arrows for 150 lb. crossbow. Extra string for 150 lb. crossbow.